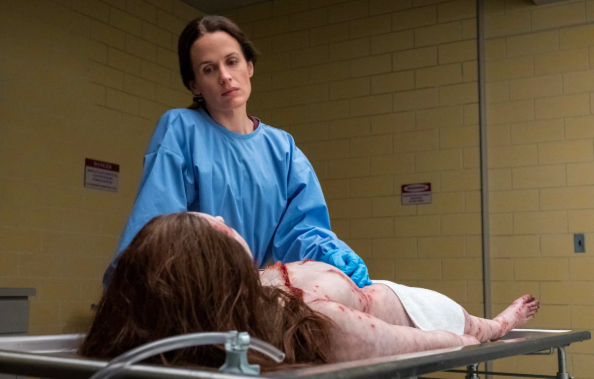 Over the weekend, The Haunting of Hill House premiered on Netflix and it is legit one of the scariest shows I've ever seen. Hill House follows the Crain family, who spent their childhood in an intensely haunted house, with several of the house's spirits still haunting them to this day. The show is split up into two time periods: The Crain's childhood and present day, which shows the psychological affects the house had on them. And one of the main characters is Shirley Crain. 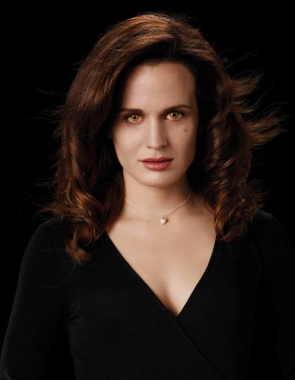 Shirley is portrayed by Elizabeth Reaser, who some of you may recognize from the Twilight movies, where she played Esme Cullen. As soon as I saw Elizabeth on-screen, my vampire-loving heart desperately hoped for a Twilight reference in any capacity. And lo and behold, I got one! For context, Shirley is a morgue technician and has a younger sister named Nell, who Shirley finds out killed herself in episode two. Shirley, being the passionate person she is, decides she's the best person to make Nell funeral-ready. Now, we can only assume Carlisle is a fellow morgue technician in the area — but does that name sound familiar? That's right, Carlisle — Esme's husband in Twilight. The reference, albeit quick, still made me happy as heck. Now, once you're done watching The Haunting of Hill House, it's only appropriate to watch Twilight. Good day!